Thermador. Santa, baby, put this oven under the tree—for me! On second thought, leave it in the kitchen and have the reindeer pull the old range/oven away to appliance heaven. 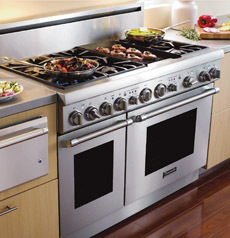 Thermador’s new 48-inch Pro Harmony® Range is everything an enthusiastic cook could dream of: six beautiful pedestal Star® Burners, an electric griddle and gas rangetop and two ovens. Two of the burners can maintain temperatures as low as 100°F—perfect for simmering delicate sauces. Perhaps the best-looking burners in the world, Thermador’s patented Star Burners deliver superior power and heat distribution while the exclusive burner pedestal allows effortless cleaning. We need it: We’re not the neatest cook. It’s so gorgeous, we’ve been going to the local showroom just to admire it—and Thermador’s other state-of-the-art appliances. See it up close and salivate over every gorgeous feature.